Spring is finally here and with the warmer weather and longer days comes a smorgasbord of amazing produce spring brings. One of the best ways to enjoy these delightful ingredients are in fresh salads. Our Development Chef, Danny Cheetham, has given us his favourite Spring Salad recipes. Peel the carrots, mooli and beetroot. Top and tail all of the vegetables and then Spiralise them, cutting the strands into 15cm lengths as you go. Add the honey into a blender and with the machine running slowly add the sesame oil so it emulsifies with the honey. .Combine the vegetables, 100ml of the dressing and the furikake until evenly mixed. Add the White wine vinegar, caster sugar and water to a saucepan, bring to the boil and whisk. Once all the sugar is dissolved, remove mixture from the heat and chill. Once chilled, add the chilli, lime juice and zest. Finely shred the red cabbage and rinse under cold water until the water runs clear. Pick the kale leaf from the stem and finely shred along with the white cabbage. Toss the ingredients together, add in the dressing and the pomegranate seeds. In a food processor, blitz the rapeseed oil, spinach, leek and half the dill. Once a smooth paste has been achieved, add the mixture to a pan, bring up to 60C and cook for 9-10 minutes while stirring. Set the mixture aside to cool and then pass through a fine muslin cloth. 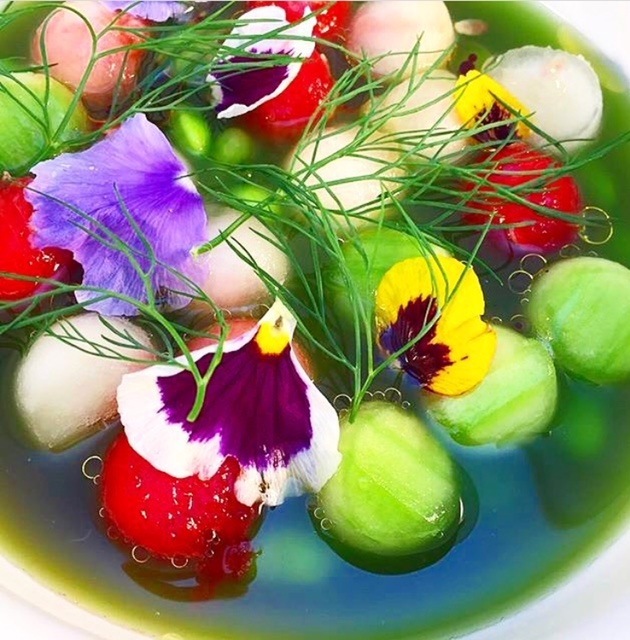 Add the melon and cucumber balls to your bowls and pour the strained liquid over the top. Drizzle in the green oil made earlier and the remaining dill springs and flowers. Are you planning to get creative with your salads this spring? We’d love to see your creations. Tweet or tag us on Instagram @Createfood, to share your pictures. If you’re not the master-chef of your own kitchen, contact us to cater your next dinner. We’ll make sure your guests leave impressed.